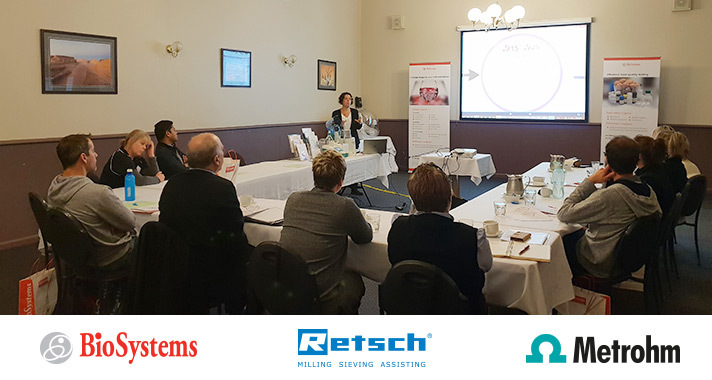 Metrohm Australia has just conducted three well-attended workshops on food and beverage analysis in Barossa Valley, Mildura and Griffith focussing on the newest random access photometric analysers from Biosystems, pH and titration as well as sample preparation. Three more workshops will be held in October in Margaret River, Melbourne and Blenheim NZ. In a busy modern laboratory for the beverage and food industry speed of analysis and management of labour cost are critical for a successful operation. Metrohm Australia, distributor of BioSystems’ Food and Enology products, provided interested customers with a hands-on experience with the latest in random access photometric analysers from Biosystems and an informative troubleshooting guide to pH and titration in the food and beverage industry helping customer achieve their goals. Thank you, dear participants, for the great turnout and active partaking in our workshops for Food and Beverage Analysis in the Modern Laboratory in Barossa Valley, Mildura and Griffith. Excellent discussions completed the informative workshops. With the latest of Retsch sample preparation, Metrohm titration and BioSystems analyser range of photometric random access analyser on display, Metrohm Australia and BioSystems shared their extensive knowledge in sample preparation and analysis to ensure you get the best out of you instrumentation. Three more workshops with this topic are scheduled for October in Margaret River, Melbourne and Blenheim NZ. These dates are still open for registration. Simply go to the link below and register for the workshop you wish to attend. On show will be our Y15 fully automated Photometric Analyzer from Biosystems, our Metrohm Modern Titrator system and our NEW Retsch Knife Mill Grindomix GM 200. This hands-on workshop will show you how to overcome day-to-day challenges from sample preparation through to sample analysis in your laboratory relating to your specific applications with experts in each field providing you their experience to gain accurate and reliable results for you analysis.